On May 14, 2018, Oleg Sentsov went on an indefinite hunger strike in a penal colony located north of the Arctic Circle. His only demand is the release of all Ukrainian political prisoners in Russia. According to Memorial’s list, there are twenty-four such prisoners. In August 2015, Sentsov was sentenced to twenty years for organizing a terrorist community and planning terrorist attacks. The second defendant in the case, Alexander Kolchenko, was sentenced to ten years in prison. Mediazona has published transcripts of the hearings in their trial. Around three hundred people have read them over the last three years. The transcripts make it plain the only evidence of the alleged terrorist organization’s existence was the testimony of Alexei Chirniy, who was not personally acquainted with Sentsov. 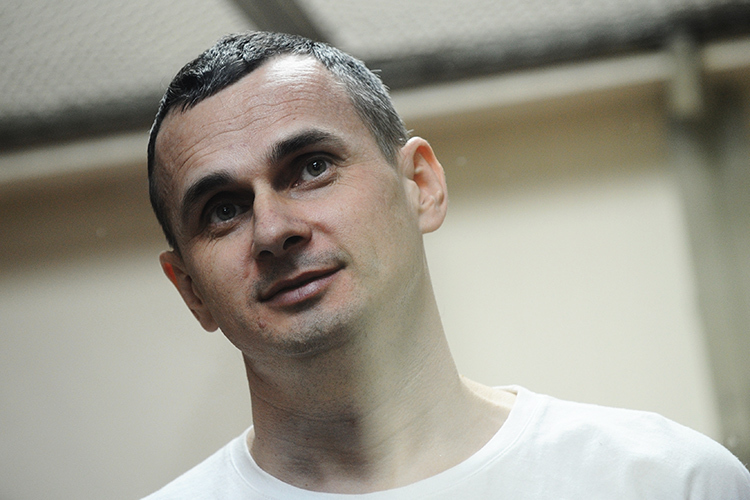 It is police footage of Chirniy’s arrest while he was carrying a rucksack containing a fake explosive device that propagandists often pass off as police footage of Sentsov’s arrest. Before his arrest, Sentsov was an Automaidan activist. 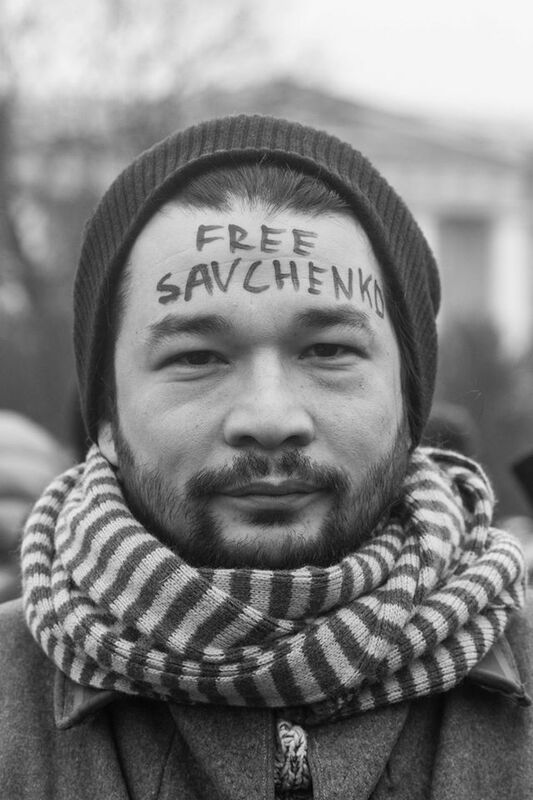 In the spring of 2014, he organized peaceful protests against Crimea’s annexation by Russia. The second defendant, Kolchenko, admitted involvement in the arson of an office that was listed in the case file as belonging to the United Russia Party, but which in April 2014 was an office of Ukraine’s Party of Regions. The arson took place at night. It was meant to cause physical damage while avoiding injuring anyone. The Russian authorities tried to prove both Sentsov and Kolchenko were linked with Right Sector, a charge that was unsubstantiated in Sentsov’s case and absurd in the latter case due to Kolchenko’s well-known leftist and anarchist convictions. Gennady Afanasyev, the second witness on whose testimony the charges against the two men were based, claimed he had been tortured and coerced into testifying against them. Sentsov and Kolchenko’s show trial, like the show trials in the Bolotnaya Square Case, were supposed to show that only a handful of terrorists opposed the referendum on Crimea’s annexation and thus intimidate people who planned to resist assimilation. The Russian authorities wanted to stage a quick, one-off event to intimidate and crack down on anti-Russian forces. But two circumstances prevented the repressive apparatus from working smoothly. The first was that the defendants did not make a deal with prosecutors and refused to acknowledge the trial’s legitimacy. The second was that Automaidan activist Oleg Sentsov unexpectedly turned out to be a filmmaker, provoking a series of public reactions ranging from protests by the European Film Academy to questions about whether cultural producers would be capable of blowing up cultural landmarks. 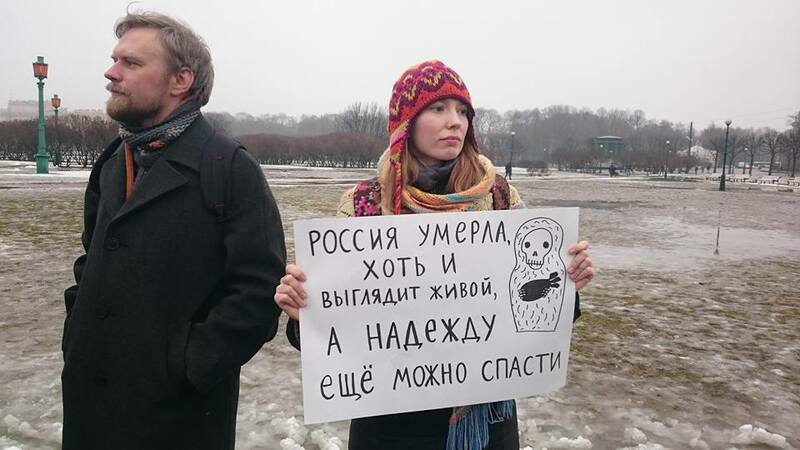 Segments of the Russian film community reacted to the situation with cold irritation. According to them, Sentsov was a Ukrainian filmmaker, not a Russian filmmaker, and he was not a major filmmaker. The owner of a computer club in Simferopol, his semi-amateur debut film, Gamer, had been screened at the festivals in Rotterdam and Khanty-Mansiysk, while release of his second picture, Rhino, had been postponed due to Euromaidan. The Ukrainian intelligentsia have equated Sentsov with other political prisoners of the empire, such as the poet Vasyl Stus, who spent most of his life in Soviet prisons and died in Perm-36 in the autumn of 1985, a week after he had gone on yet another hunger strike. The Ukrainian authorities see Sentsov, a Crimean who was made a Russian national against his will and is thus not eligible for prisoner exchanges, as inconvenient, since he smashes the stereotype of the treacherous peninsula, a part of Ukraine bereft of righteous patriots. Sentsov’s death on the eve of the 2018 FIFA World Cup would be a vexing, extremely annoying nuisance to the Russian authorities. Sentsov is an annoyance to nearly everyone, but he is a particular annoyance to those people who, while part of the Russian establishment, have openly defended him, although they have tried with all their might to avoid noticing what an inconvenient figure he has been. Although he was not a terrorist when he was arrested, he has become a terrorist of sorts in prison, because his trial and his hunger strike have been a slowly ticking time bomb planted under the entire four-year-long post-Crimean consensus, during which some have been on cloud nine, others have put down stakes, and still others have kept their mouths shut. Yet everyone reports on the success of their new endeavors on Facebook while ignoring wars abroad and torture on the home front. Sentsov represents a rebellion against hybrid reality and utter compromise, a world in which Google Maps tells you Crimea is Russian and Ukrainian depending on your preferences. To what count does “bloodlessly” annexed Crimea belong, if, four years later, a man is willing to die to say he does not recognize the annexation? The success of Gamer on the film festival circuit, which made Sentsov part of the international film world, and his current address in a prison north of the Arctic Circle beg three questions. What is culture? Who produces culture? What stances do cultural producers take when they produce culture? There are several possible answers. Culture is a tool for reflection, a means for individuals and societies to achieve self-awareness and define themselves. It is not necessarily a matter of high culture. In this case, we could also be talking about pop music, fashion, and rap. (See, for example, the recent documentary film Fonko, which shows how spontaneous music making has gradually been transformed into a political force in post-colonial Africa.) On the contrary, culture can be a means of spending leisure time for people with sufficient income, short work days, and long weekends. Obviously, the culture produced in Russia today under the patronage of Vladimir Medinsky’s Culture Ministry is not the first type of culture, with the exception of documentary theater and documentary cinema, but the founders of Theater.Doc have both recently died, while Artdocfest has finally been forced to relocate to Riga. The compromised, censored “cultural production” in which all the arts have been engaged has no way of addressing any of the questions currently facing Russia and the world, from shifts in how we view gender and the family (for which you can be charged with the misdemeanor of “promoting homosexualism”) to the relationship between the capitals and regions (for which you can charged with the felony of “calling for separatism”). Crimea is an enormous blank spot in Russian culture. Donbass and the rest of Ukraine, with which Russia still enjoyed vast and all-pervasive ties only five years ago, are blank spots. But cultural producers have to keep on making culture, and it is easier to say no one is interested in painful subjects and shoot a film about the complicated family life of a doctor with a drinking problem and a teetotalling nurse. When we speak of the second type of culture—culture as leisure—we primarily have in mind Moscow, which is brimming over with premieres, lectures, and exhibitions, and, to a much lesser extent, Russia’s other major cities. So, in a country whose population is approaching 150 million people, there is a single international film festival staged by a local team for its hometown, Pacific Meridian in Vladivostok. All the rest are produced by Moscow’s itinerant three-ring circus on the paternalist model to the delight of enlightened regional governors. It matters not a whit that one of them ordered a brutal assault on a journalist, nor that another was in cahoots with the companies responsible for safety at the Sayano-Shushenskaya Dam, where 75 people perished in 2009. What matters is that the festival movement should go on. There is no room in this model for local cultural progress. There can be no free discussion generated by works of art when everyone is engaged in total self-censorship. After I went to Festival 86 in Slavutych, whose curators have been conceptually reassessing the post-Soviet individual and the post-Soviet space, I found it painful to think about Russian film festivals. This sort of focused conceptualization is impossible in Russia. It is of no interest to anyone. There are two more possible answers to the question of what culture is. Culture is propaganda. Or, finally, culture is only the marquee on a commercial enterprise profiting at the taxpayer’s expense. It is not a big choice, and the kicker is that by agreeing today to be involved in churning out propaganda, milking taxpayers, supplying optional leisure time activities, producing censored works, and colonizing one’s own countrymen for the sake of money, status, and membership in a professional community, the people involved in these processes automatically stop making sense. It is naïve to think the audience has not noticed this forfeiture. It is no wonder the public has an increasingly hostile reaction to cultural producers and their work. No one has the guts to exit this vicious circle even in protest at the slow suicide of a colleague convicted on trumped-up charges, because it would not be “practical.” The events of recent months and years, however, should have transported us beyond dread, since everyone without exception is now threatened with being sent down, the innocent and the guilty alike. Post-Soviet infantilism is total. It affects the so-called intelligentsia no less than the so-called ordinary folk. Infantilism means being unable to empathize, being unable to put yourself in another person’s shoes, even if that person is President Putin, a man with a quite distinct sense of ethics, a man who has been studied backwards and forwards for twenty years. Apparently, the message sent to the creative communities through the arrest of Kirill Serebrennikov was not registered. If you want to be a dissident, start down the hard road of doing jail time for misdemeanor charges, facing insuperable difficulties in renting performance and exhibition spaces, becoming an outsider, and experiencing despair. If you want a big theater in downtown Moscow, play by the rules. Like your average late-Soviet philistine, Putin regarded the creative intelligentsia with respect at the outset of his presidential career. (See, for example, footage from his visit to Mosfilm Studios in 2003.) However, a few years later, he was convinced the creative intelligentsia was a rampantly conformist social group who would never move even a millimeter out of its comfort zone and would make one concession after another. A lack of self-respect always generates disrespect in counterparts. By signing open letters while remaining inside the system and not backing their words with any actions whatsoever, the cultural figures currently protesting the arrests of colleagues are viewed by the authorities as part of the prison’s gen pop, while people who live outside Moscow see them as accomplices in looting and genocide. No one takes seriously the words of people who lack agency. Agency is acquired only by taking action, including voluntarily turning down benefits for the sake of loftier goals. The acquisition of agency is practical, because it is the only thing that compels other people to pay heed to someone’s words. I will say it again: the acquisition of agency is always practical. At very least, it generates different stances from which to negotiate. Sentsov has made the choice between sixteen years of slow decay in a penal colony and defiant suicide in order to draw attention not to his own plight, but to the plight of other political prisoners. Regardless of his hunger strike’s outcome, he has generated a new scale for measuring human and professional dignity. It is an personal matter whether we apply the scale or not, but now it is impossible to ignore. On November 17, FSB officers came to Kaluga resident’s Roman Grishin workplace and took him away to an investigator. After being interrogated on camera, Grishin was informed he stood accused of inciting enmity and hatred (Criminal Code Article 282.1) for reposting a video in 2014. Grishin wrote about the incident on Facebook on December 18. He was released on his own recognizance as a suspect in a criminal case. “A group of FSB officers in balaclavas and special kit showed up in the morning at my work, plunging my coworkers into a considerable stupor,” writes Grishin. The video is entitled “New Hit from Kharkov! This Is Russism, Baby.” Acccording to Grishin, it is freely accessible on YouTube. As Grishin told OVD Info by telephone, the main topic of his interrogation by FSB officers was his regular trips to Ukraine. They asked why he had his picture taken on the Maidan. Grishin visits the country as a tourist, stays with friends, and stresses that he does not collaborate with any organizations in Ukraine. Grishin lives in Kaluga. Educated as a philologist, he works as a proofreader. The FSB’s scrutiny has been a real shock to him. “I never voiced any appeals [for enmity or hatred]. You could say I’m a couch activist,” he said. This is not the first case of persecution for publishing the video to Boris Sevastyanov’s song “This Is Russism, Baby.” Previously, however, its posting was the occasion for filing misdemeanor charges of disseminating extremism matter (Administrative Offenses Code Article 20.29). 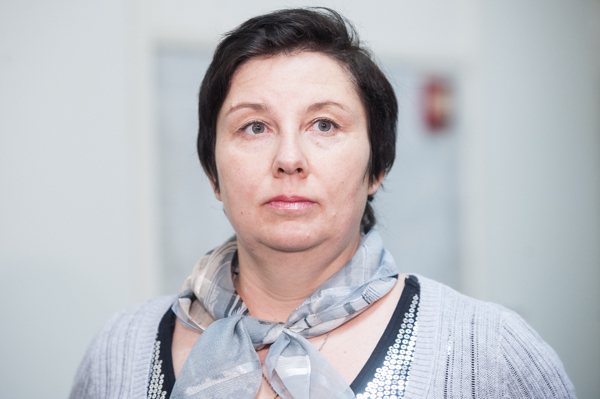 In April 2016, Krasnodar LGBT activist Nina Solovyova was convicted of commmitting a misdemeanor for posting the video and sentenced to ten days in jail. Solovyova told her story to OVD Info in April of this year. Now, two years later, it is clear the annexation of Crimea has had only negative consequences for Russia. Crimea set off a chain reaction that gave rise to the war in eastern Ukraine (which would never had happened if not for the annexation) and, later, the military action in Syria, leaving thousands of people killed and producing hundred of thousands of refugees. Ukraine, Russia’s closest neighbor, has been made an enemy for years to come. Nobody in the world has publicly supported the annexation. In fact, most countries in the world have condemned it. Russia has been excluded from a number of international organizations and clubs, where its voice is no longer taken into account, meaning a huge blow has been dealt to the country’s image and its international status. The sanctions have greatly exacerbated the economic crisis, which has hit the quality of life in Russia hard. The number of poor people has increased, investments have decreased, and future prospects have worsened. The annexation has opened the way for the rise of hysteria and aggression and a political clampdown at home. This has had a devastating effect on culture, human relations, and human rights, and has generated all the conditions for Russia’s political self-destruction. The negative consequences are so numerous that it will be difficult to turn the situation in a positive direction. If the annexation continues, however, these negative effects will continue to grow. In terms of Russia’s interests, it was definitely a rash, mistaken, and criminal move. BRUSSELS/MOSCOW (Reuters) – The European Union called on Friday for more countries to impose sanctions on Russia over its annexation of Ukraine’s Crimean peninsula two years ago, but the Kremlin said Crimea was Russian land and its status non-negotiable. In a statement issued on the anniversary of the formal absorption of Crimea into Russia, the 28-nation EU said it was very worried about Moscow’s military build-up in the region. The EU also said it would maintain sanctions that ban European companies from investing in Russian Black Sea oil and gas exploration. The Kremlin responded by saying the issue of Crimea could not be “a matter of negotiations or international contacts”. “Our position is known: this is a region of the Russian Federation. Russia has not discussed and will never discuss its regions with anyone,” President Vladimir Putin’s spokesman Dmitry Peskov said in a teleconference with reporters. “In this case we should treat with respect the expression of the will of Crimean residents and the decision which was taken two years ago,” he said. Peskov was referring to Crimea’s referendum on secession from Ukraine in March 2014, which was followed by a formal request from the local parliament to the Russian Federation to admit it as a new subject with the status of a republic. On Friday Putin will visit the construction site of a bridge being built to Crimea across the Kerch Strait to connect the Russian mainland with the peninsula, Peskov added. 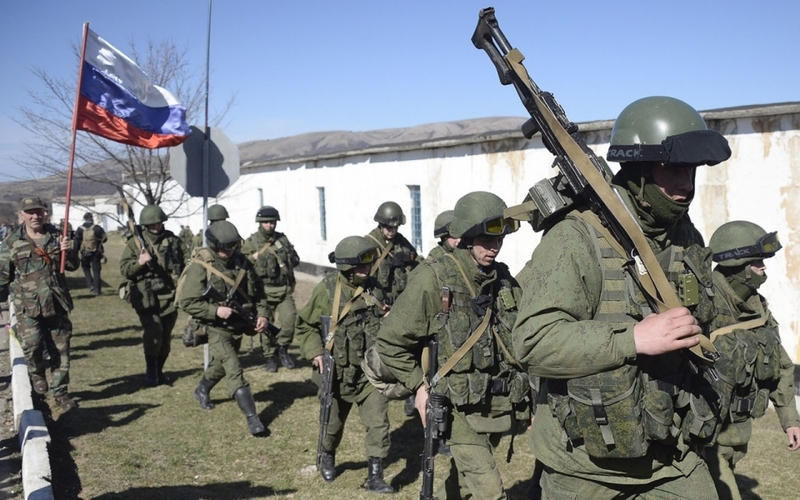 NATO and the EU are concerned by Russia’s military build-up in Crimea, which they say is part of a strategy to set up defensive zones of influence with surface-to-air missile batteries and anti-ship missiles. As well as the EU, the United States, Japan and other major economies including Australia and Canada have also imposed sanctions on Russia over Crimea, but others including China and Brazil have avoided direct criticism of Moscow. The 28-nation EU imposed its Crimea sanctions in July 2014 and then tightened them in December 2014, banning EU citizens from buying or financing companies in Crimea, whose annexation has prompted the worst East-West stand-off since the Cold War. After Russia’s annexation of Crimea, an armed separatist revolt erupted in mainly Russian-speaking eastern Ukraine that Kiev and its Western backers said was fueled and funded by Moscow. Russia denies the charges. I accept neither guilt, nor the verdict, nor the Russian court. In the case of a guilty verdict there will be no appeal. I want the whole democratic civilized world to realize that Russia is a third-world country, with a totalitarian regime and a petty tyrant-dictator, where human rights and international law are spat upon. It is an absurd situation when those who abduct people subject them to torture then act as if they have a right to judge them! How can one talk about a fair trial? In Russia, there are no trials or investigations, only a farce played out by Kremlin puppets. And I find it superfluous to waste time in my life participating in it! And so there will be no appeal, but this is what will happen: After the verdict I will continue my hunger strike for 10 more days, until the verdict comes into force, and this is regardless of the translation [of the verdict] into Ukrainian, because they can drag that out for a long time, too. In 10 days I will begin a dry hunger strike [refusing both food and water], and then Russia will have no more than 10 days to return me to Ukraine, where they abducted me! And I don’t care how they justify it! I have heard that [Ukrainian President] Petro Oleksiyovych Poroshenko is quite adept at diplomacy. I hope his diplomatic skills will suffice to reach agreement in Russia with a certain idiot; after all, he promised my mother that I would be home in time for the May holidays of 2015. And while they are bargaining over me, my life will be draining away and Russia will return me to Ukraine in any case: it will return me, dead or alive! Throughout these 10 days, day and night, my sister will be standing at the jail gates, and she will wait and see whether they release me or not. And if you put her in jail, my mother will come and take her place. She is 77, will you put her in jail, too? In that case my friend will take her place, and after her, Ukrainian after Ukrainian! And remember: you can’t shove everybody in here. And while my compatriots are standing there, simple, honest, and decent Russians living in nearby homes will bring them hot tea, sandwiches, and warm blankets, because each one of them understands that tomorrow their child could be in my place, in this prison of all peoples called Russia! That is how Maidans (revolutions) start! Do you need that?! You fear it like the plague! So it is better for the Kremlin to return me to Ukraine as soon as possible, and alive! And those in the world with democratic values ought to learn their history lessons before it’s too late and remember that there was a time when Europe was tolerant toward Hitler, and America wasn’t decisive enough, and this led to World War II. Putin is a tyrant with imperial manners and a Napoleon and Hitler complex put together. The [Russian] bear doesn’t understand human language, he understands only the language of force. Therefore, unless we become more decisive and determine the right priorities on time, we will soon have World War III. And I, as a politician now, won’t shake Russia’s hand in the political arena. It is not right to extend a hand to someone who kept you in handcuffs and your people in chains. But every time I make a political decision, I will always think how it would affect ordinary people, both in Ukraine and Russia. Because in Russia, in spite of everything, there are many honest, kind, and decent people. 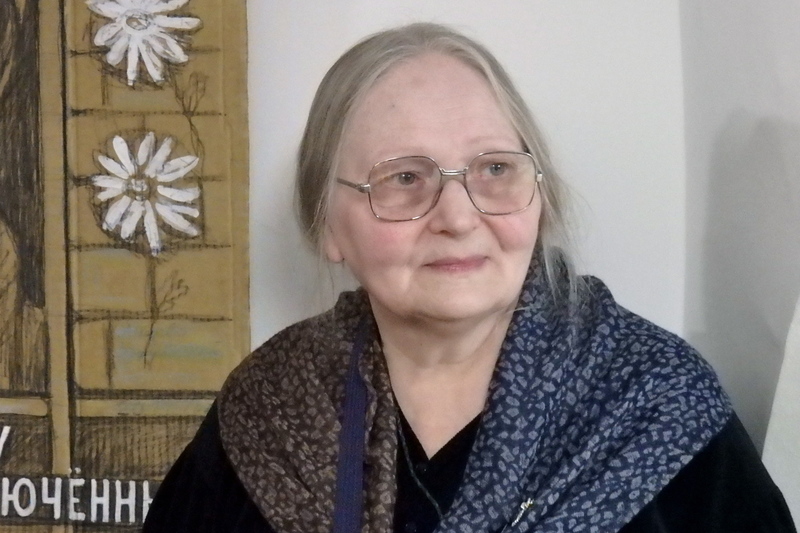 Yekaterinburg’s Zheleznodorozhnyi District Court has found single mother Ekaterina Vologzheninova guilty of inciting social hatred and enmity (Russian Criminal Code Article 282), reports Grani.ru. The court has sentenced the woman to 320 hours of compulsory community service and ordered her laptop, which served as physical evidence in the case, destroyed. As Grani.ru explains, the court based its verdict on the conclusion reached by a forensic linguist that Vologzheninova had incited “ethnic [sic] hatred and enmity towards volunteers from Russia” who were involved in the armed conflict in eastern Ukraine, as well as towards public officials. Criminal charges were filed against Vologzheninova after she [re]posted Anatoly Marushkevich’s poem “Katsaps,” along with an image of a young Ukrainian woman and the caption “Death to the Moscow Occupiers,” and a caricature featuring a man resembling Vladimir Putin leaning over the Donbass holding a knife. The last post was later excluded from the evidence. A cozy basement with uncomfortable pictures: that is how one might describe in a nutshell the exhibition of paintings and posters by Petersburg artist Yelena Osipova currently underway in the Petersburg office of Open Russia, which shares the space with the Petersburg office of the Parnas party. 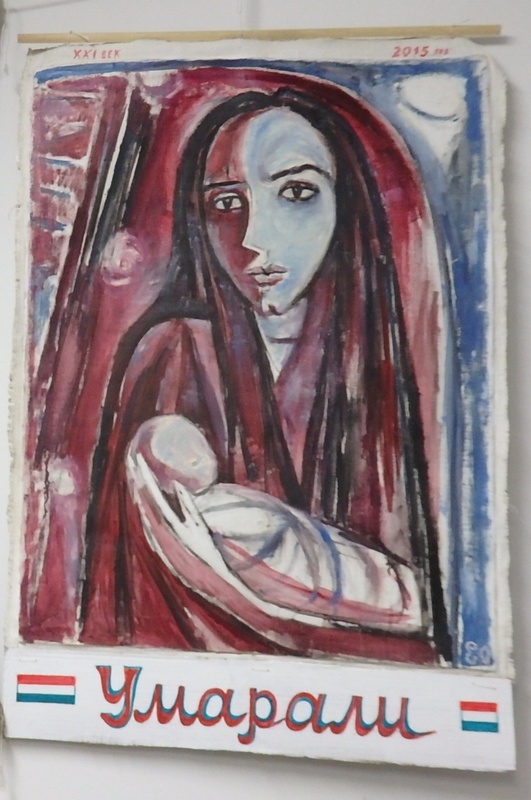 The exhibition marks a milestone—Osipova has turned seventy—but it is her debut exhibition. She has never been a member of any artist unions and groups, but she has stood outside in the rain, frost, and heat at nearly all the protest rallies that have taken place in Petersburg in recent years. The striking posters that Osipova holds at these rallies expose the latest injustices or crimes, warn of dangers, and empathize with the plight of others, whether they have been victims of terrorist attacks, natural disasters, dishonest elections or civil rights violations. The exhibition was not easy to put together. 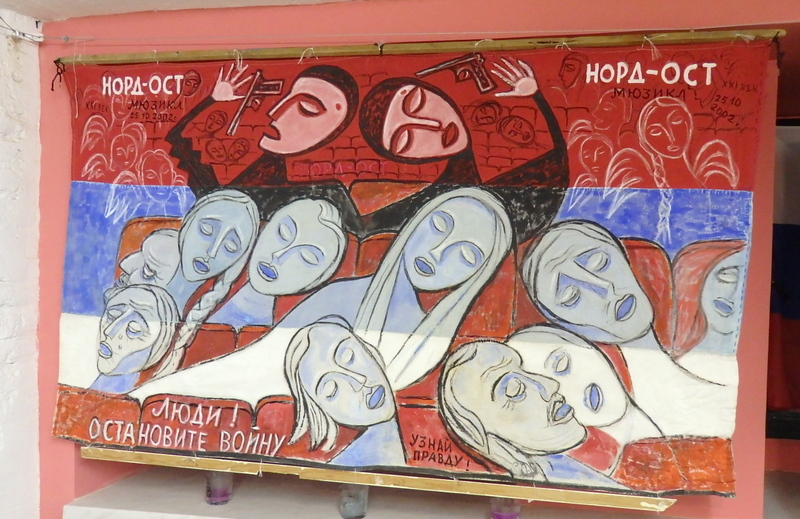 The organizers set out to show not only Osipova’s best political posters but also her paintings, mainly portraits and landscapes. The show also includes two large genre scenes, the first featuring an ordinary Soviet beer hall, the second, a group of punks. Perhaps they are the link to the posters, which call to mind not only the tradition of political satire but also primitivist painting. “This exhibition is the first in my life,” says Yelena Osipova. “And I love the room and these vaulted ceilings and the fact you can see how my paintings segue into the posters. The latest poster, showing a mother with a dead infant, is about the dead Tajik boy Umarali Nazarov, while the first was prompted by the Nord-Ost tragedy in 2002. 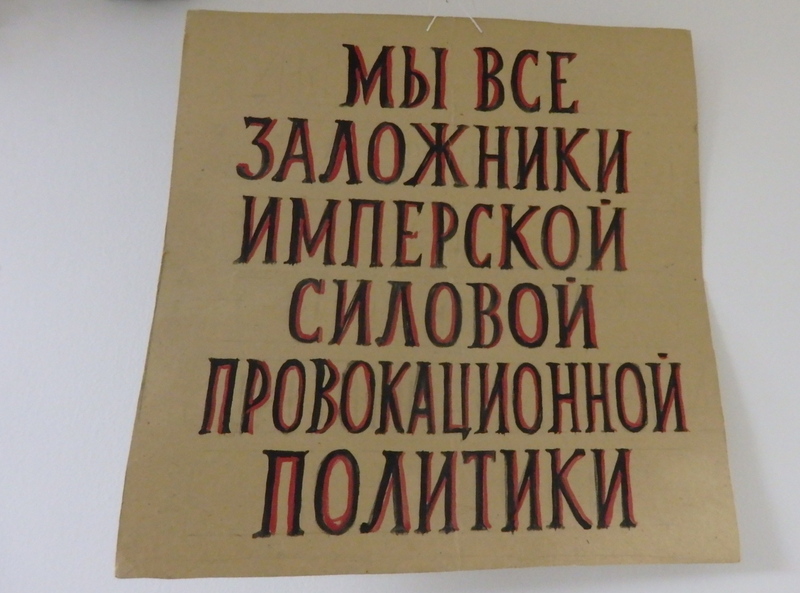 Then I went to the Mariinsky Palace [seat of the Saint Petersburg Legislative Assembly] with a simple lettered poster, handwritten on a sheet of wove paper. I just could not understand why no one took to the streets then, why everyone was silent. 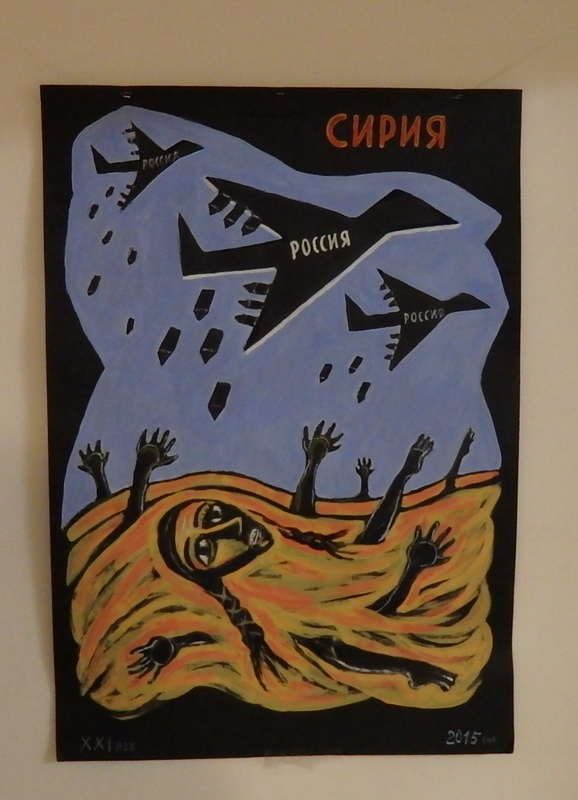 On the fortieth day after the deaths of the hostages, I made a poster in which I painted a picture in acrylics on fabric. In an Andersen story, a girl sold matches in Denmark in the nineteenth century: matches. (Read Andersen’s fairytales to children.) 2012, the twenty-first century. Children are commodities. This is the end of the world. Adoption should be free. Foster care should be free. In Russia, children sell narcotics: narcotics. You are a professional artist. Where did you study? So you mostly painted landscapes and posters, then Nord-Ost happened and you turned to posters. What exactly happened after Nord-Ost? But this indifference has continued. Look how many people came to the rally protesting the death of the Tajik baby Umarali Nazarov, who was taken away from his mother. Have you been detained at protests? “Of course I have been detained. There was a G20 summit here one summer. I went there with two posters: Don’t believe in the justice of war! and another one about the disposal of nuclear waste. The police detained me then, and I have been detained many times since, sometimes quite roughly. There were unpleasant incidents outside the Mariinsky Palace on St. Isaac’s Square when the war with Ukraine began. Yet the people who go to these events think like you do, and that is quite important. You feel you are not alone with your thoughts, that there are other people who think the same way. Okay, so there are not so many of them, but they are out there. Are there any landmark works, works important to you at this exhibition? “Yes, for example, Theater Entrance. 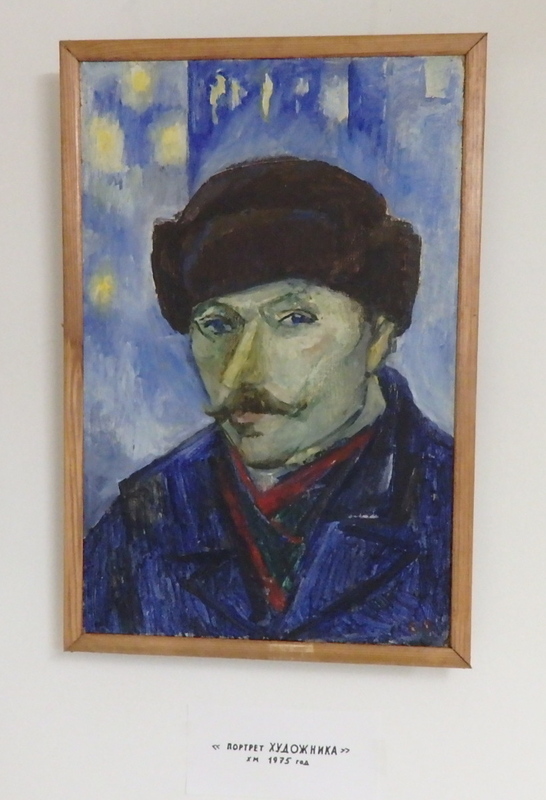 I painted it during my fourth year at art school. I was really into the theater then, and my thesis painting had a theatrical motif. There are also three paintings here from my Vologda series, pictures of fields in Vologda. There is a landscape painting of Gurzuf, in Crimea. The big painting shows a beer hall that was behind the Nekrasov Market. It had these big round arches, and the beer was poured straight from a tap. You could meet professors and students and artists there. I have painted Russia there with a halo, looking sad. It was the nineties, a very complicated time. And my other painting on this subject is Punks in the Subway. I knew all those kids. The musical Nord-Ost, October 25, 2002. Stop the war, people! Learn the truth! And what is Oh mania, oh mummy of war…, featuring two crows? “It’s an anti-war poster. 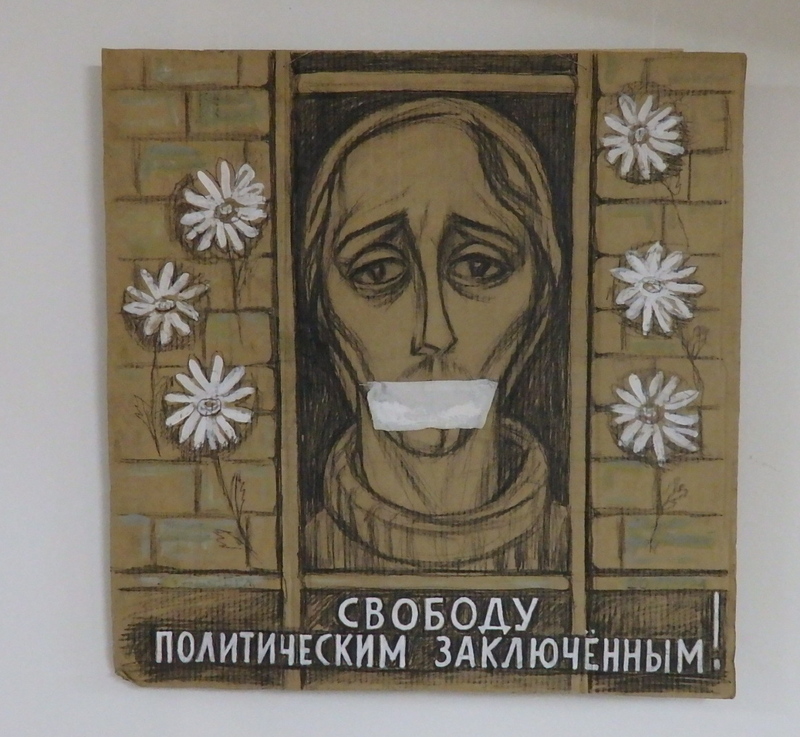 I drew it after Boris Nemtsov’s murder. I used a poem by Marina Tsvetayeva. She wrote it in Germany, and I saw the resemblance with our circumstances. The poster Not everyone who is naked is needy is about the death of Berezovsky. I play on the birch motif [Berezovsky’s name is derived from the Russian word for birch tree, berëza], and there are funereal crows. Do you appreciate some of your posters more than others? Will you continue to make new posters and freeze on the streets? At the entrance to the exhibition is a small poster, Vote for the bird. 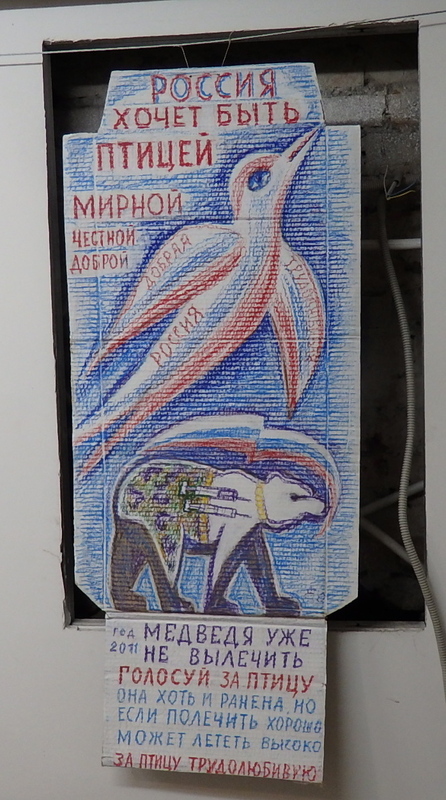 At the bottom of the poster is a heavy United Russia, pumped full of oil; on the top is a bird. 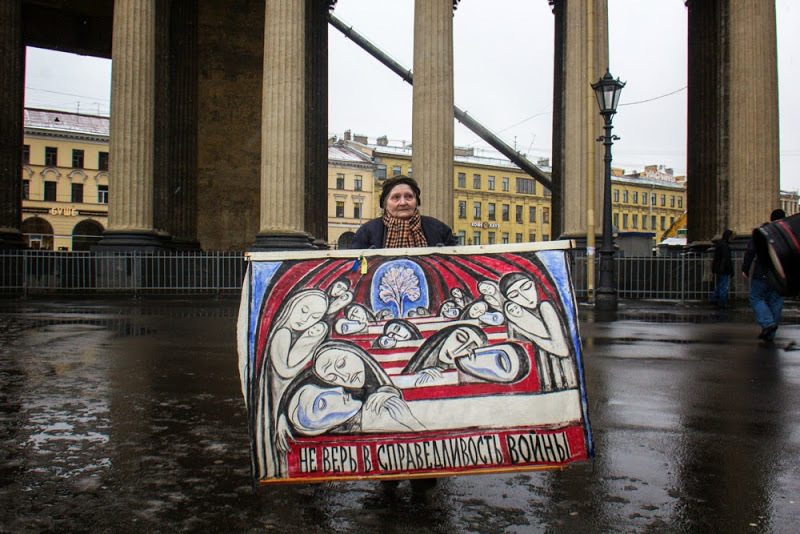 “The bird has always been the symbol of Russia,” argues Yelena Osipova. And to her mind, Russia’s color is blue, as in a certain painting by her beloved Wassily Kandinsky. True, Osipova now sees less and less of the color in her homeland’s plumage. Translated by the Russian Reader. All photos by the Russian Reader except where otherwise indicated. 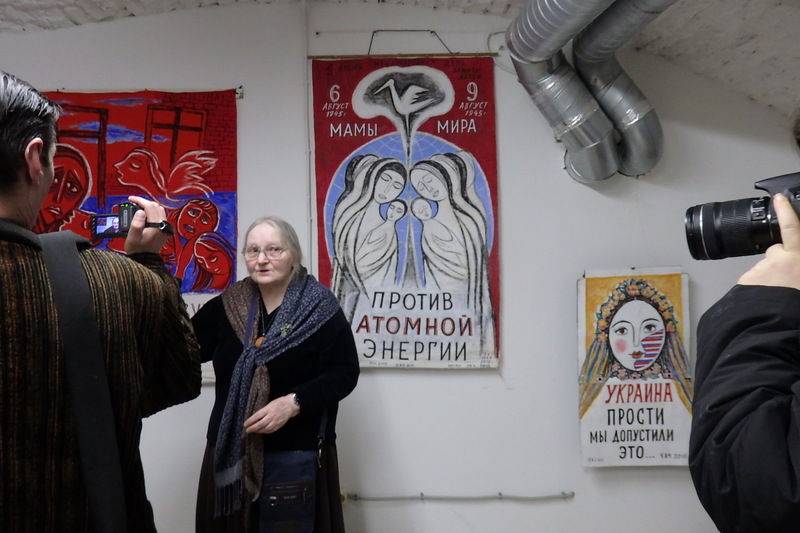 Yelena Osipova’s work will be on view at 19 Fontanka Embankment until November 25, 2015. 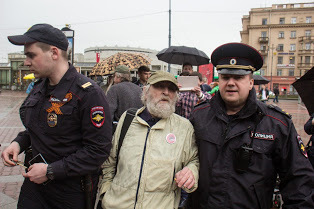 Petersburg police detained two activists and a photojournalist near Park Pobedy metro station on May 8 as pro-Kremlin provocateurs attempted to prevent Democratic Petersburg activists from handing out buttons and leaflets dealing with the end of the Second World War in Europe. The Democratic Petersburg coalition, which opposes Russia’s current Second World War victory symbol, the St. George’s Ribbon, claiming it is “distinctly militarist,” passed out buttons featuring the red remembrance poppy, a European symbol for war victims, and leaflets explaining its meaning. In 2014, Ukraine had rejected the St. George’s Ribbon, used by Russia-backed rebels in eastern Ukraine and Russian officialdom, choosing the remembrance poppy instead. 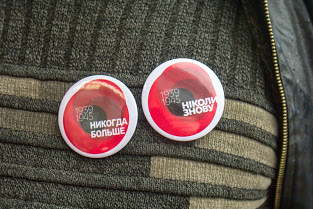 The buttons the activists handed out were emblazoned with the red poppy and the phrase “1939–1945 Never Again,” in Russian and Ukrainian, while the leaflets, which quoted John McCrae’s famous poem “In Flanders Fields,” described the symbol’s history and meaning. Activists said Victory Day should be commemorated on May 8, because Russia was part of Europe, rather than on May 9, in keeping with Soviet tradition. According to them, what Russians have usually called the Great Patriotic War was in fact part of the Second World War and was launched in 1939 by both Germany and the Soviet Union, rather than in 1941, when Germany suddenly attacked its formal nominal ally the Soviet Union. 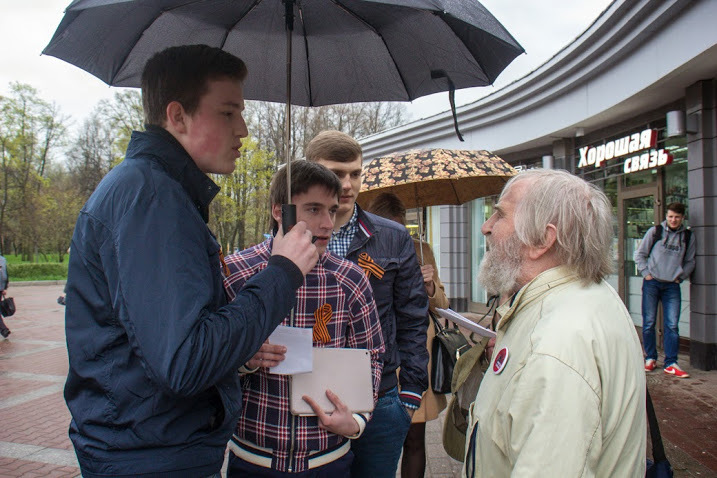 The pro-Kremlin provocateurs, mostly young people, who were apparently led by two older men, were already waiting outside the metro station, sporting St. George’s Ribbons, when the Democratic Petersburg activists arrived to hand out leaflets. The provocateurs approached them and started an argument, justifying Joseph Stalin and promoting what they saw as the Kremlin’s current interpretation of the war’s history. Some of the provocateurs took photos and videos as the argument proceeded. However, when asked, one of the young provocateurs said he was “just passing by,” denying he had come deliberately with the others to harass the Democratic Petersburg activists. Within minutes, police had arrived at the scene, led by a colonel, the head of Precinct No. 33, whose beat includes the Park Pobedy station. The colonel argued with the activists before detaining 76-year-old activist Igor “Stepanych” Andreyev and, seconds later, our correspondent, who had attempt to photograph Andreyev’s arrest. While the two detainees were held in the police room inside the metro station, police detained Anton Kalinyak, an activist who had been wearing a large red poppy on his lapel, allegedly for “using coarse language in public.” According to Democratic Petersburg, one of the provocateurs filed a false complaint with the police against Kalinyak, while the police officers at the scene corroborated his accusations. The detainees were taken to Precinct No. 33, where they were charged, correspondingly, with “smoking in a public place” and “using profane language in a public place.” After about two hours in custody, Kalinyak was fined 500 rubles (around $10) on the spot, while the formal written charges against the other two detainees will be sent to their respective local police precincts. They face small fines of between 500 and 1,500 rubles.